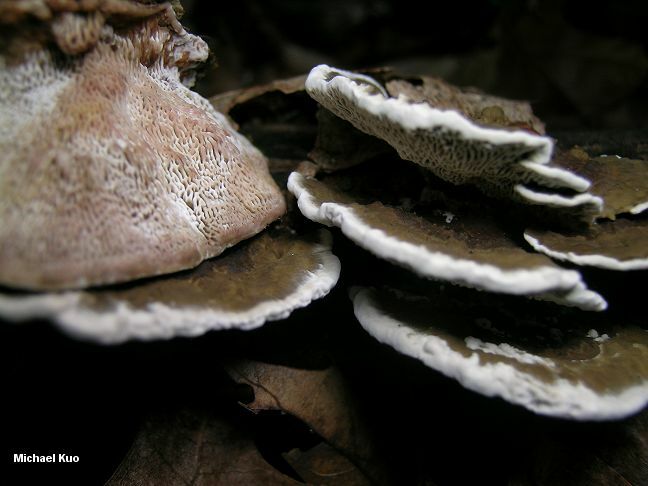 Daedaleopsis confragosa is a highly variable species--or cluster of species, perhaps--recognized by its elongated, maze-like pores; its thin, whitish to brownish cap with zones of color; and the tendency of its pore surface to bruise reddish. However, each of these theoretically distinctive features is subject to variation. 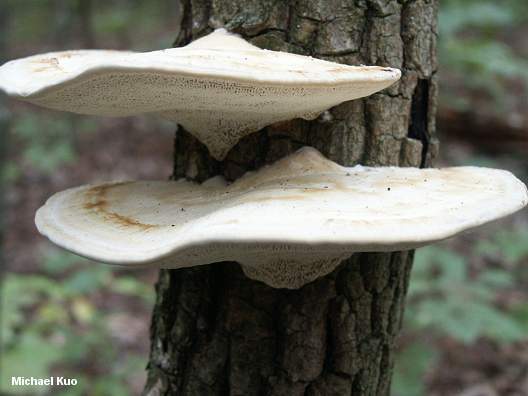 The pore surface can develop in odd ways, leading to confusion with round-pored species, or even with "gilled polypores" like Lenzites betulina. To make matters worse, the zones of color on the cap are not always clearly evident, and the pore surface does not always bruise red, especially if you are looking at an older specimen. See the comments below for help with eliminating look-alikes. 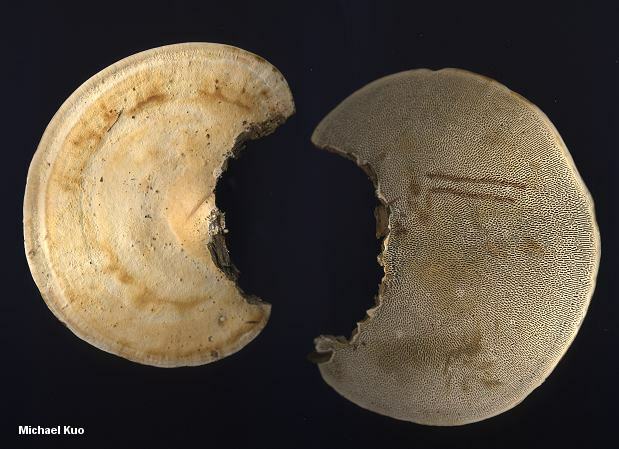 In central Illinois, two distinct versions of Daedaleopsis confragosa are relatively common. The first is the "classic" version, with a zoned, brown cap. It grows on a variety of hardwoods, but seems to have a particular taste for the wood of dying flowering dogwood trees (Cornus florida). The second version (see the bottom illustrations) is nearly white, but otherwise more or less identical. I have found it on the wood of elms and willow. Daedalea quercina prefers oaks (though it also grows on other hardwoods), has much thicker walls between the pores, produces smaller spores (5.5-7 x 2.5-3.5 µ), and does not bruise reddish. 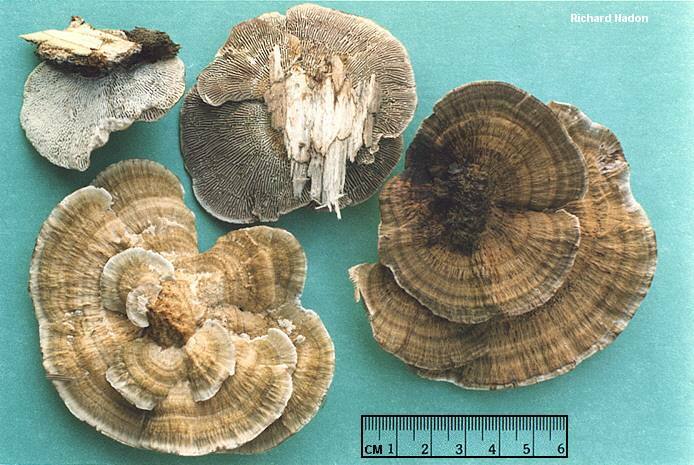 Trametes elegans (formerly Daedaleopsis ambigua) has a whitish cap and smaller spores (5-7 x 1.5-2.5 µ); its pore surface varies from maze-like to gill-like or more "normally" pore-like (often all three on the same mushroom!) and does not bruise reddish--and its flesh turns yellowish, rather than blackish, with KOH. Daedalea confragosa is a former name. 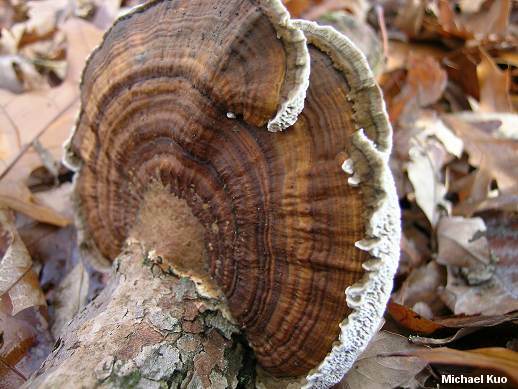 Ecology: Saprobic; growing alone or gregariously on decaying hardwood logs and stumps, or rarely from the wounds of living hardwoods; partial to birch, willow, and many other hardwoods, but only rarely on oak; very rarely on conifer wood; summer through winter; widely distributed, but more commonly encountered east of the Rocky Mountains. 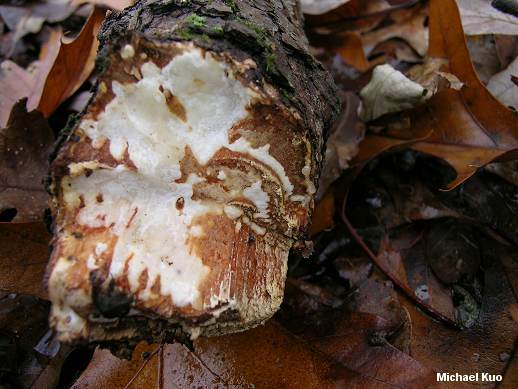 The fungus produces "a white delignifying decay of the sapwood" (Overholts, p. 122); see the illustration to the right. In some types of host wood the rot is "associated with the formation of black lines in the decayed wood." Cap: 5-15 cm; broadly convex to more or less flat; fan-shaped or nearly round in outline; dry; smooth or minutely hairy; pale grayish to brown or reddish brown; typically with zones of color. 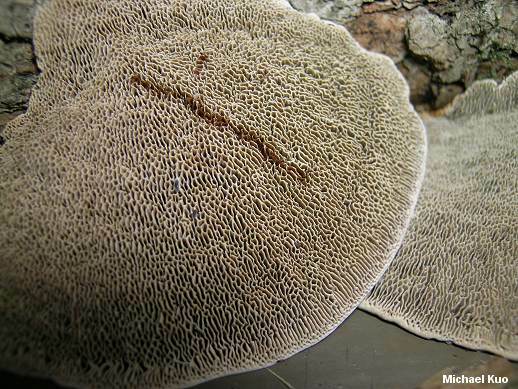 Pore Surface: White, becoming dingy brownish in age; typically with elongated, maze-like pores and fairly thin walls between the pores, but sometimes with more or less round pores, or even with the pores elongated so much that they appear like gills; often bruising salmon pink to reddish when handled. Flesh: White, or pinkish to brownish; very tough. Microscopic Features: Spores: 7-11 x 2-3 µ; smooth; cylindrical to elliptical. REFERENCES: (Bolton, 1792) Schröter, 1888. (Persoon, 1801; Fries, 1821; Saccardo, 1888; Overholts, 1953; Smith, Smith & Weber, 1981; Arora, 1986; Gilbertson & Ryvarden, 1986; Phillips, 1991/2005; Lincoff, 1992; Barron, 1999; Roody, 2003; McNeil, 2006; Binion et al., 2008.) Herb. Kuo 09300306, 10290404, 11220407, 02200501, 02200502.